Since moving to the Mississippi Gulf Coast a few years ago, I have tried many amazing po’boys, but I may have found my favorite at a gem of a deli in Long Beach. The Long Beach Market and Deli is family-owned and operated by Chef Lucia van Norden, her husband Maxim, and their children Dustin and Devona. It opened in the fall of 2011 and locals and tourists have found out by word of mouth that this unique place offers a menu with dishes that must be experienced. Chef Lucia learned the art of flavor and food design from her upbringing in South Korea, as well as the professional training she received as a graduate of the Le Cordon Bleu Culinary School in Ottawa. Prior to fulfilling the dream of opening her own restaurant, she worked as a table games pit boss for over a decade at a Gulfport casino. When Hurricane Katrina wiped it out, she took it as a sign to start anew and trained at the world-renown school. When the opportunity came up to acquire what was formerly known as Pineville Mart, they renovated the space and Chef Lucia created a menu that not only puts a twist on traditional Asian cuisine, but also features Cajun, vegetarian and American dishes. Everything on the menu at the Long Beach Market & Deli is made from scratch, and with the infusion of sweet, spicy and savory in many of the dishes, you will be sure to find many to love. Two of the most popular dishes are the General Tso and the Sweet & Sour specials that are made with chicken, pork or shrimp. It includes fried rice and a Crab Rangoon, with options to substitute for an egg or spring roll. The grilled chicken, steak and shrimp wraps made with a spinach tortilla wrap also are really popular. The Summer Rolls are light and filling, and are wrapped in rice paper that includes spring mix, cilantro, spicy Sriracha mayo, lettuce, cucumbers, bell peppers, pickled red onions, radishes and carrots. Veggie rolls are available and you also can get one made with shrimp tempura, spicy crab, or try the tasty Vietnamese roasted pork version called Banh Mi. For an extra kick, you can add jalapeño peppers. Another unique item they offer is a Middle Eastern dish called falafel, which is a deep-fried chickpeas patty in a pita pocket stuffed with with spring mix, tomatoes, red onions and cucumbers. The dish is served with flat bread and sides of homemade hummus and tzatziki sauces. It is absolutely delightful. The Long Beach Market & Deli has a nice selection of po’boys, which are made on Gambino French bread, as well as sandwiches and burgers served on sesame or brioche buns. 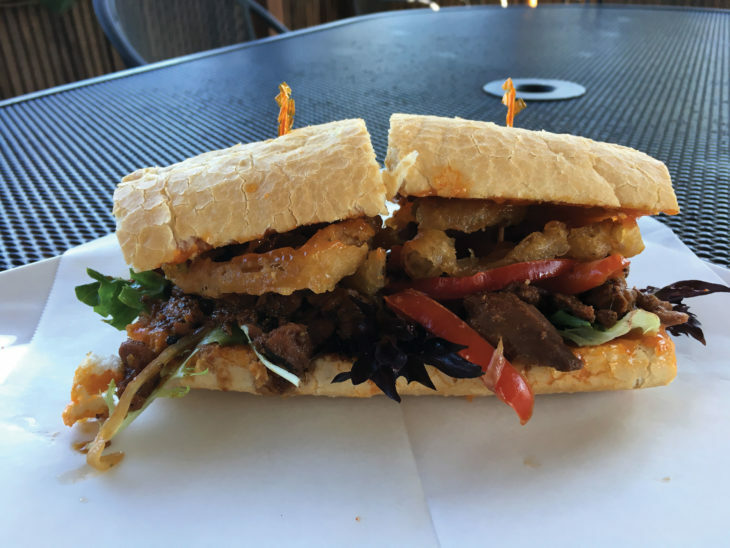 Choices include catfish, shrimp, roast beef, grilled steak, Banh Mi, and what I now consider my favorite sandwich on the Coast, the Kogi Po’boy. This tasty po’boy is filled with Korean-style barbecue chicken, sautéed onions, bell peppers, spicy Sriracha mayo, and topped with fried onion rings. It’s the perfect mix of sweet and spicy and I’m already anticipating a return visit for another. Besides the incredible food, the Long Beach Market & Deli features one of the largest cold selections of beer on the Coast. With more than 200 varieties of craft beer available, you can build your own six-pack, or they also have 10 different beers on tap to fill a growler or buy a pint while dining. Long Beach Market & Deli is open seven days a week, Monday through Friday, 8 a.m.-8 p.m. and 10 a.m.-8 p.m. on the weekends, with daily lunch specials served from 11 a.m.-4 p.m. The pet-friendly patio features outdoor seating with live music often on Saturday afternoons. To save time, you also can place your order online at lbmarketanddeli.com.